Discontinued. Vaillant has been established for over 140 years and is proud of its reputation for performance, quality and reliable products. 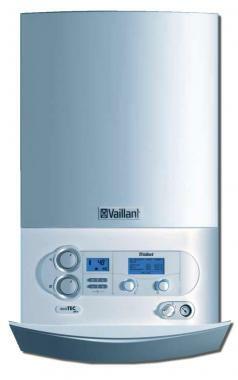 The Vaillant ecoTec plus 937 is a high-efficiency combination boiler with a large heating output. The fact it can produce a vast amount of hot water makes it ideal for larger properties and those households where a large amount of hot water on demand is paramount. This wall mounted boiler unit is unusual in that it comes in two parts, as it has a separate storage tank fitted inside the casing making it easier to handle during installation. The Boiler unit weighs 38kG and the storage tank 17kg. This unusual design for a combi boiler means it is also bigger than most at 72x44x60cm. Most boilers are now rated B following SEDBUK's revision on efficiency in 2009 however don't let this put you off, a boiler with at least 88% efficiency is really no worse than one that is 90%. The 937 is no exception and with a rating of 89.30% efficient ensures it will waste as little energy as possible. Low emissions of noxious gases mean that this particular boiler is environmentally friendly which has led to it being awarded an 'Energy Saving Recommended' logo from the Energy Saving Trust. The ecoTEC plus 937 power store is a high efficiency combination boiler which is ideally suited for properties with high water demands. The boiler and tank are separate for easier handling and all the major components are built within. As the name suggests, the power store features low power consumptions from 8 to 44W, this is down to a fully modulating energy efficient pump. Further features are the range of plug in control accessories and an expansion vessel. Has a central heating output range from 12.0 – 28.0kW. the 937 is a fantastic boiler.90 pumps out of 100 fail due to muck in them due to a system filter not fitted or system not flushed out correctly.ALL gas boilers need to be serviced on an annual basis.all boiler makers who offer extended gtes insist so.5 YEAR GTE = 4 SERVICES ! Run Far Run fast!! !, Firstly the pump blew up after being installed for 15 months, leaking all over the place with Central Heating fluid. Warranty is not 2 yrs its a conditional 2 yrs( boiler must be serviced within first year for the second year of the warranty to be valid, they like to keep you in the dark about that), most other boiler manufacturers offer at least 5yrs warranty as standard, hmm (Vaillant must not have much confidence in the Quality of their own product to offer such a low warranty period). Secondly Vaillant telephone support didnt really seem to care either, 3 days to get an engineer out to look at the bolier and Im without central heating or hot water in the meantime!!!. Telephone support, even though the offices are closed you ring them on an 0870 number and they say all our operators are busy at present!!! (there is nobody there, they are sucking me dry in telephone charges, even though the staff arent there!!). In the end their engineer never turned up, so I had to pay out for an engineer myself plus a new pump! !.